Staff Selection Commission, popularly known by its acronym SSC, is an attached office of the Department of Personnel and Training. Initially known as the Subordinate Services Commission, Staff Selection Commission makes recruitment for Group "B" (Non-Gazetted) and Group "C" (Non-technical) posts in the various Ministries/Departments of the Indian Government and its Subordinate offices. Every year, the SSC conducts recruitment through various examinations like; SSC CGL (Combined Graduate Level Examination), SSC CHSL (Combined Higher Secondary Level), SSC CPO (for Sub-Inspector), SSC Multitasking (for Non-technical) etc. 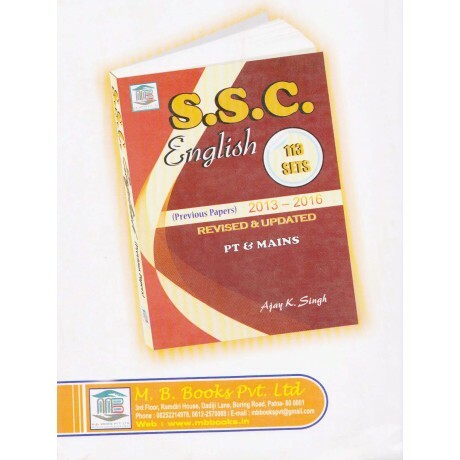 English Language is an equally weighted section in the examination. English Language test your Grammatical Knowledge and Vocabulary. The book at hand helps in cracking this hard nut by gradually building up the core Grammatical Concepts, starting from a very basic level.